In the area of refrigerant monitoring, the use of gas detection systems is becoming ever more important with the increasing conversion of refrigerant types and national legislation. 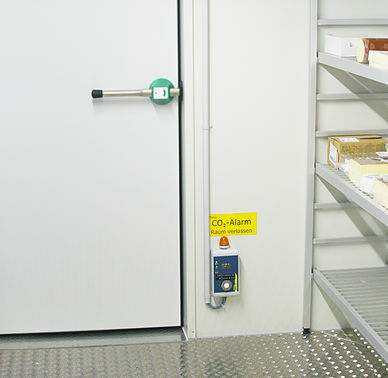 We provide solutions to monitor various gases that occur or are used in the laboratory and in cold storage rooms such as freons, CO2 and NH3 for the protection of personnel and the environment. The applicable hazards alter when the refrigerant gas type is changed on site. Particularly hazardous are the combustible gases that result in an explosive gas/air mixture. However, “naturally” occurring gases such as odourless and highly toxic carbon dioxide also constitute a toxic hazard. 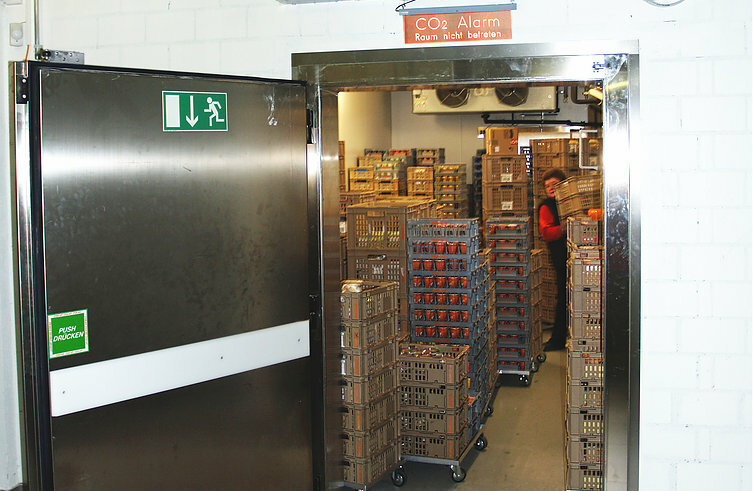 KIMESSA warning systems offer solutions such as our BUS combination messages with built-in display that is installed on the front of or inside the cold storage room and sends both visual and audible alarms (type CWED 68). The BUS-wiring for the measurement points and messages is a particular cost-saver. These are also available as analogue, BUS or ex-measuring point designs. Touch screens can be mounted at the entrance to the cold room for visualization and rapid gas monitoring data checks. All measurement data and events are recorded and can be reproduced and analysed at all times. 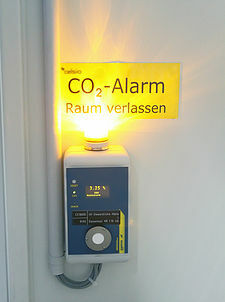 With the Plug’n Play capable Web server CWS 101 “Easylog”, gas concentrations are visualized in real time on a computer network, enabling events such as alarms or faults to be sent by email to the responsible personnel. KIMESSA collaborates with several well-known suppliers of refrigeration control systems with regards to refrigerant monitoring. 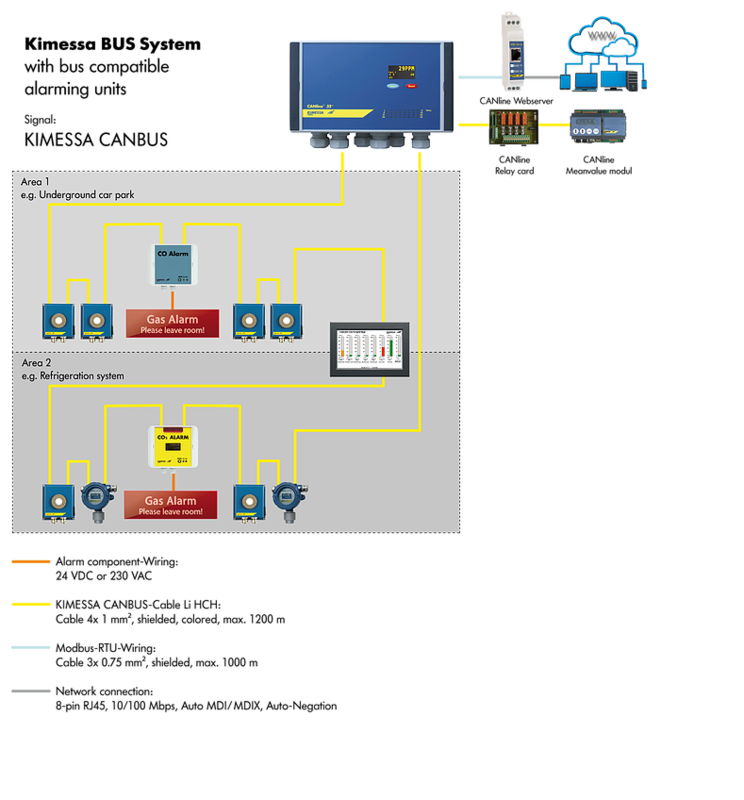 All KIMESSA gas monitors are compatible with these refrigeration controls via the digital Modbus RTU interface. This has the advantage that the gas detection system can pass information directly to the refrigeration gas monitor and therefore no own alarm chain is required. In the area of refrigerant monitoring, we not only offer different gas detectors with various measuring principles, but also gas monitors and alert components. We offer a selection of stand-alone gas detection units with built-in detector and 6 different measuring channel variants (1-128). 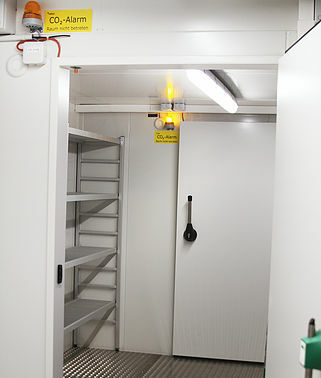 In addition we offer a comprehensive BUS based refrigerant monitoring solution. This is extremely economical with regards to the often occurring long cable runs. KIMESSA provides complete solutions, including alarm alert instruments/messages. These are alarm devices are integrated into the BUS topography offering flexibility and low installation costs. BUS technology offers extremely versatile programming possibilities. The pre-wired MONOline 230/24V gas detection unit has been designed specifically for the monitoring of small refrigeration systems and is available for a wide range of refrigerant gases. As standard, the unit has a built-in optical light and a loud integrated audible alarm. The alarm limits and relay programming can be easily changed to customer requirements in a non-intrusive manner using a magnetic pen. In addition to the stand-alone-operation, the unit has an analog output signal (4-20mA) or it can be connected via the digital output to the CANline control unit or to a Modbus enabled control system. The detectors can be easily replaced with pre-calibrated detectors.